Andrei was born in Tchaikovsky, Perm Region, in 1991. Graduated from the Tchaikovsky Moscow State Conservatory (class of Leonid Lebedev, the People's Artist of Russia). Now he continues his studies as a post-graduate student (class of the same teacher). 2008 – winner of the “Spring in Russia” International Moscow Festival. 2005-2006 – fellow of the Bystritskaya Foundation. 2006-2007 – fellow of the "Russian Performing Art” Fund. 2013 – winner of the 5th Paolo Serrao International Music Competition (Italy) in the Solo category, 2nd prize-winner in the Duet category. 2013 – winner of the 3rd "Night in Madrid" International Music Competition (Spain). 2014 – winner of the 6th "Giovani Musicisti" International Music Competition (Treviso, Italy). 2015 – winner of the 6th International competition «Premio Antonio Salieri», prize of Giuseppe Magnani and special prize «Virtuosite» (Legnago, Italy); winner of 4th Stockholm International Music competition (Sweden). 2017 – laureate of the II prize at the XXII International Music Prize Gaetano Zinetti (Verona - Sanguinetto, Italy). Andrei took part in the master-classes of William Bennett, Philip Bernold, David Formisano, Pierre Yves-Artaud, Vincent Lucas, James Galway. He is a regular participant of various concerts in the Small, Rachmaninov, Mirror halls of the Tchaikovsky Moscow State Conservatory as well as in the concert halls of the House of Moscow Region Government, Moscow Kremlin Historical Museum, Pushkin State Museum of Fine Arts. Roerich, Chaliapin, Tsaritsyno museums, Glazunov Gallery, Tchaikovsky Conservatory Central Music School, etc. The musician has performed solo concerts in Russia and abroad, as well as played with different chamber ensembles (duets with harp, organ, violin, trio and quartet with strings, brass quintet). 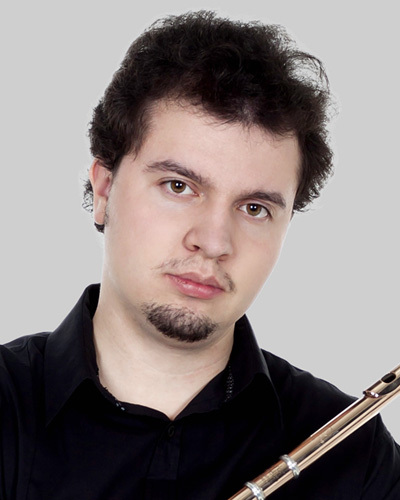 Since 2014, Andrei has participated in the Saint-Petersburg Music House programs.